The family of a teenager gunned down by the British Army in the early years of the Troubles are appealing for witnesses to the killing to come forward. Gerard Gibson was shot in the head in Carrigart Avenue in Lenadoon on July 11, 1972. His family are hoping the investigation into the 16-year-old’s murder will be reopened and are appealing for anyone with information to come forward. 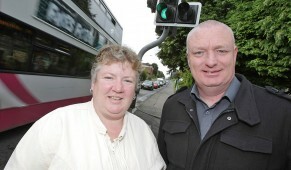 LOCAL political representatives have welcomed the installation of a new filter light at the bottom of the Suffolk Road.